The western part of Futenma housing area on Camp Foster returned to Okinawa Prefecture on Mar. 31. 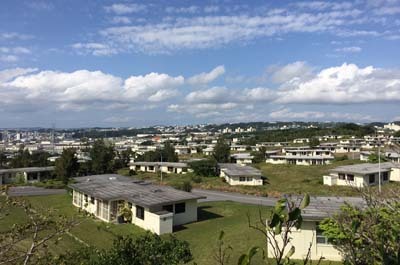 The former Futenma family housing area is scheduled to change into a large medical center, residential housing and park over the next 10 years. For the future development, the returned land is divided into four major divisions. A 20-hectare part of the area is earmarked for a medical division with plans to build a prefecture administered advanced heavy particle cancer therapy facility. The University of the Ryukyus Faculty of Medicine, including the University Hospital, is also scheduled to move from its current location in Nishihara into a new facility to be constructed on the land. The Futenma High School will move into a new school building that will be built on a 5-hectare lot in the area called the education division. 10 hectares are reserved for residential development, and another 10 hectares will become an urban park zone. The schedule for the development and construction will be finalized in July. The land was to be returned to its original owners officially on Apr. 1, but the Okinawa Defense Bureau has suspended the return while it removes the still standing old U.S. military residential houses and surveys the land for unexploded ordnance and possible contamination, and removes them as needed, meaning the actual return of the land to the owners will take place two and half to three years later. In addition, there are some historical sites that need to be safeguarded and surveyed. The reversion ceremony for the area will take place on Apr. 4th with Japanese and U.S. Government officials and local public attending.